AntiPlagiarism.NET is the program for automated detection of digital plagiarism that originated from the world wide web. It's designed to use the biggest open database in the world - that of the search engines. Checked documents do not leave you computer. The application uses Google, Bing and other search engines. SEO Plagiarism Checker is a desktop tool that will crawl your website checking every page's content to see if that content is elsewhere on the internet. - Plagiarism Detector - is a Plagiarism Detection Software to check for Plagiarism in text documents. It is a fast and reliable Plagiarism Checker! - Plagiarism Detector is a Microsoft Windows 10 (XP,Vista,7,8 etc.) desktop application to check sets of documents against the major search engines databases trying to locate the possible sources and define the exact amount of shared information. - Plagiarism Detector's main task is the automated detection of digital plagiarism (that is unauthorized copy-paste of textual material) that originated from the world wide web. It was designed to use the biggest digital publicly open database in the world - that of the search engines. - Plagiarism Detector has lots of features (see next page) that cover all possible situations when it comes to text comparison and search! 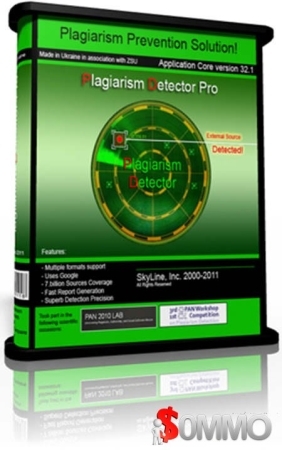 - Plagiarism Detector has won multiple Plagiarism Detection competitions in multiple countries. It has been recognized as one of the best available solutions for Plagiarism Detection and Prevention! - Plagiarism Detector was built with KISS principle: structural complexity with functional simplicity! Plagiarism Checker X helps you detect plagiarism in your research papers, blogs, assignments, and websites. With higher speed and accuracy, you can easily check your document's authenticity in just a few seconds. Welcome to one of the best plagiarism checker tools online — NBridge Plagiarism Finder. Plagiarism Finder by NBridge offers quick detection of previously published exerts in texts. With the help of this application students can check their work before submission to ensure it will pass plagiarism checkers, and teachers' job of finding copies becomes simpler. Cross-referencing allows lecturers to notice similar passages in assignments of a particular class or group. Being able to instantly identify unoriginal paragraphs is also a great assistance for researchers, journalists, and blog writers. Unintentional plagiarism may not be forgiven, and properly investigating a chosen topic is the responsibility of the writer. For publishers, running a swift check of submitted stories for plagiarism is a compulsory requirement to have a piece of mind. Copyright violation may become an expensive oversight. If you are seeking a cheap plagiarism checker, Nbridge Plagiarism Finder combines affordability with deep text analysis. It checks through more search engines and databases (including Google Books and Google Scholar), while being substantially more affordable than its analogues. Constant updates and cross-checking against its own unique database increase its ability to find duplicate content.